Plyometric exercises are typically used by sprinters and power athletes to develop their fast twitch muscle fibers and improve their speed and agility. The question is—can plyometric training improve the performance of athletes in triathlon or other endurance sports? Let’s first focus on running in particular. If you were to analyze video of various runners, you would notice that the faster, more efficient runners spend less time on the ground. They are using more stored energy with each foot strike to accelerate into the next stride. Plyometrics train the body to reduce this ground contact time while running and can also improve overall running mechanics. Explosive exercises like squat jumps and kettlebell swings make muscle fibers stronger and more flexible by stretching them prior to contraction. Think about your quad muscles when jumping: your muscles stretch as you bend your needs into a squat position, and then contract as you jump up. Do this repeatedly and those muscles get stronger with every contraction. This strength will not only improve endurance while running, but can help generate the explosive power to execute a sprint on the bike. Think about how many times your feet hit the ground when running—it may not be hard but it’s continuous, sometimes for hours at a time. As you run, you not only have to propel yourself off the ground with one foot, but also absorb the forces generated as you strike the ground with your other foot. If your body can’t efficiently execute this process over the course of a race, the resulting fatigue can lead to other issues, including injuries and deteriorating performance. You often see Ironman races decided in the late stages of the run when it all comes down to how efficient the athlete can be when fatigued. What plyometrics can do is teach your brain to activate certain muscles at certain times to take the load of your body while working at speed. This is key to injury resistance. When your brain knows at what time to activate what muscles, you can reduce significant impact to your spine and other joints, and are less likely to twist your ankle, for example. With plyometrics you will teach your brain that it can still work properly and efficiently, even when the body is tired. It is your central nervous system (CNS) which controls your muscles in order to swim, bike and run—your skeletal muscles are not very smart and they simply do as the CNS tells them. But the CNS does not activate all the fibers in a muscle at once. The act of running, for example, is a coordinated orchestra of contraction, stabilization, and relaxation of all the muscles in your body. Strength and plyometric training teach the body how to better coordinate muscle contractions, which help movements become more and more efficient. In fact, when athletes add plyometrics into their training from the beginning, most see gains in performance very quickly. The best way to introduce your body to plyometric training is to start with ankle hops (hopping on the ankles using the calf muscles with straight legs) and then build to skipping rope. However, for many athletes, the ankle hops are enough! This may be all of the jumping that you need to improve. Start with 3×10 ankle hops twice per week. When you are ready to try skipping, perform 3×30 skips with two legs, and then you can progress this into 2 hops left leg, 2 hops both legs, 2 hops right leg… and so on. Stand on top of a strong platform 8-12 inches high (the greater the height, the greater the strength component, the lower the height the greater the speed component). Focus your gaze eye-level straight ahead of you while you step slightly forward off the platform, landing on two feet on the ground at the exact same time. React as quickly as possible to the ground to spring back up into the air as high as you can vertically. Swing your arms to vigorously upward as your feet hit the ground to add speed and power to your jump. Stand on your right leg, with a slightly bent knee in a runner’s position. Picture creating a square on the floor for this exercise. Focus your gaze eye-level straight ahead as you hop forward and stick the landing. Now hop to your right—and stick the landing before you hop backwards (stick the landing), and finally to the left again to finish 1 box. 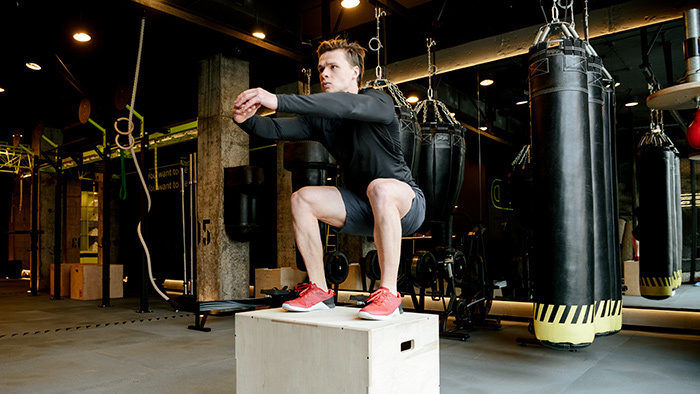 Perform 3 boxes (12 hops) on the right leg and then repeat with the left leg. Thank you to Lauren Babineau for her contribution to this article.